Calibrating and tuning a CS50 (and I assume the other nearest siblings) is an iterative process. There are pitfalls at every step, and when you finally reach the end you get a nice easter egg -a tuned 4 (or more) voice synth! In the last post I quickly diagnosed why my CS50 didn’t make a sound -having the TU (tuning) voltage jumped to ground. This post is about other problems. The CS50 circuitry has a lot of functions that are distributed among a couple of boards, so you may find you have a tuning problem originating in your SUB board, or a portamento problem originating from your PRA board. Well, I had a TU problem coming from my SUB board – no matter what I tried, I got 6.5 volts at the TU terminal -trim pots had no effect… this terminal is supposed to be 4.000 volts. Lots of head scratching and component replacement later I decided to just order a CS50 SUB board from synthparts.com -a handy side effect of CS50 voice boards being worth $400 – $500 each, making the CS50 worth about 2x it’s ‘complete working’ value in parts is that CS50 specific parts are CHEAP. I got a complete front panel and lower chassis in like new condition for $150 while I was at it. Too much money probably, but not bad really if you just want to fix your cheaply obtained synth that just happens to be worth more as parts. 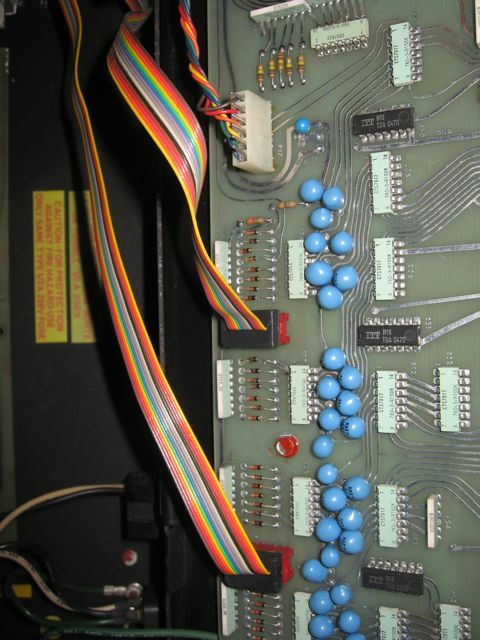 For those mad enough to attempt a repair or god-forbid restoration of their PolyMoog, here is a running list of parts I have/will/need to replace. This will be updated as I get stuff. 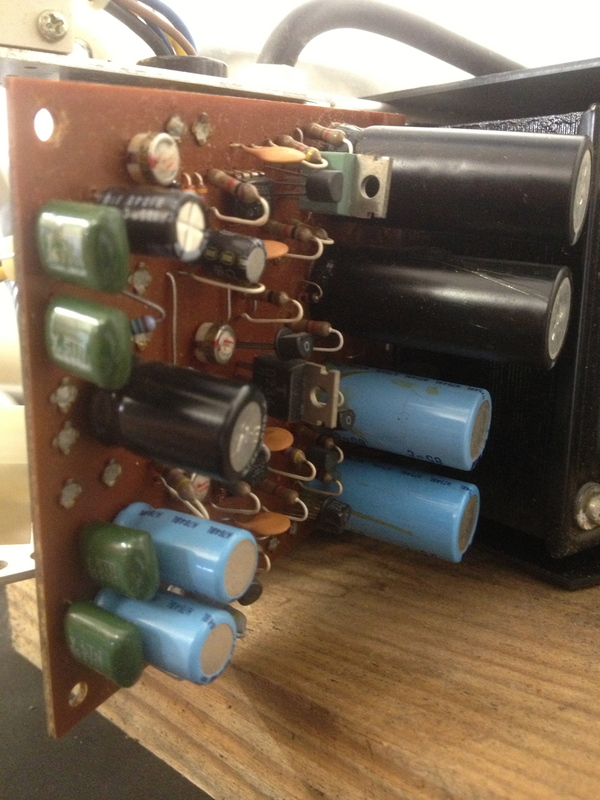 Power Supply has had its capacitors replaced. 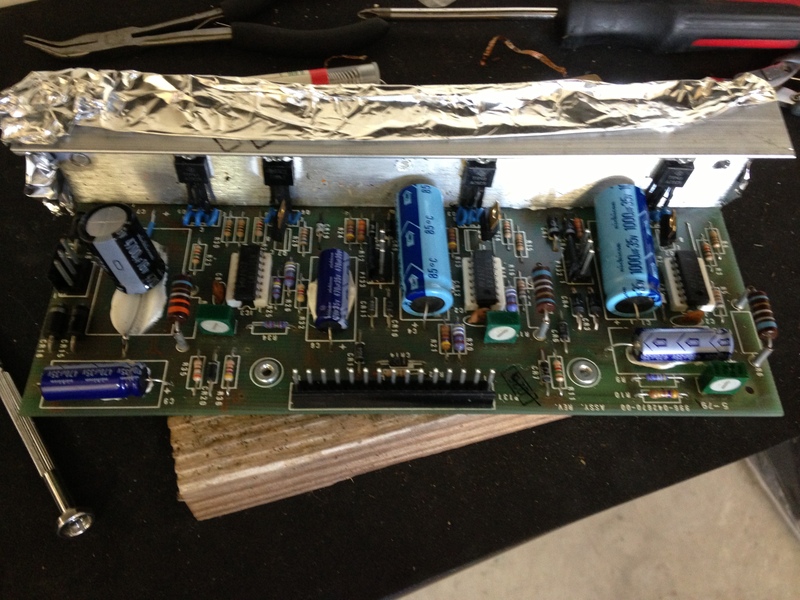 Note the 4700uF is a radial -they were out of axial capacitors in the rating I needed. P o w e r s u p p l y : : : : : . Few synthesizers have such a bi-polar reputation. Amazing sounding and tedious to maintain, much less restore are the two poles of this equation. 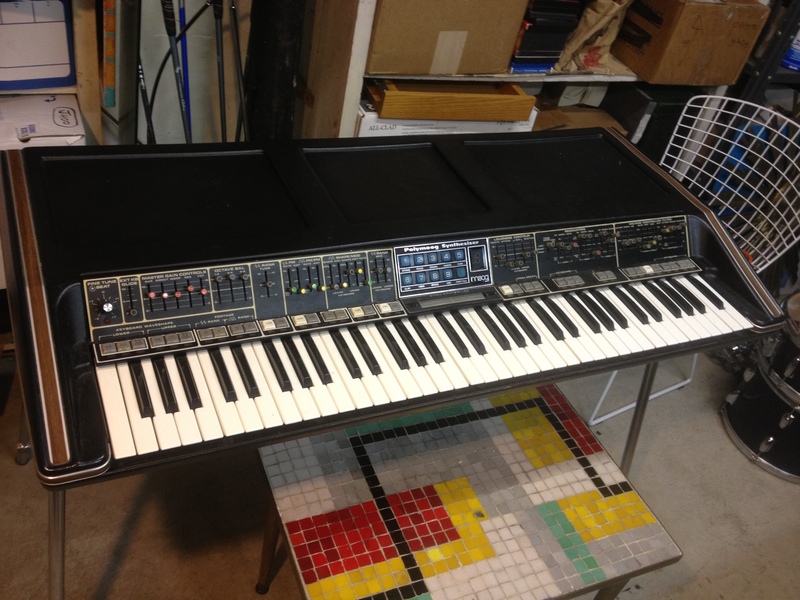 Moog churned out a few of these – I am guessing a little over 4000 since this fellow is serial number 4021 and I’ve never found a reference to a later one. Gary Numan famously used the Polymoog and so did a list of other luminaries if VSE is correct, but there isn’t anyone recent on that list. I’m excited to fix this to see what it can do in a modern setting. It just happens sometimes. You mention you have an X you are looking to get rid of, and a friend says they have a Y they’d like to get rid of. A little cash one way or the other sweetens the deal. 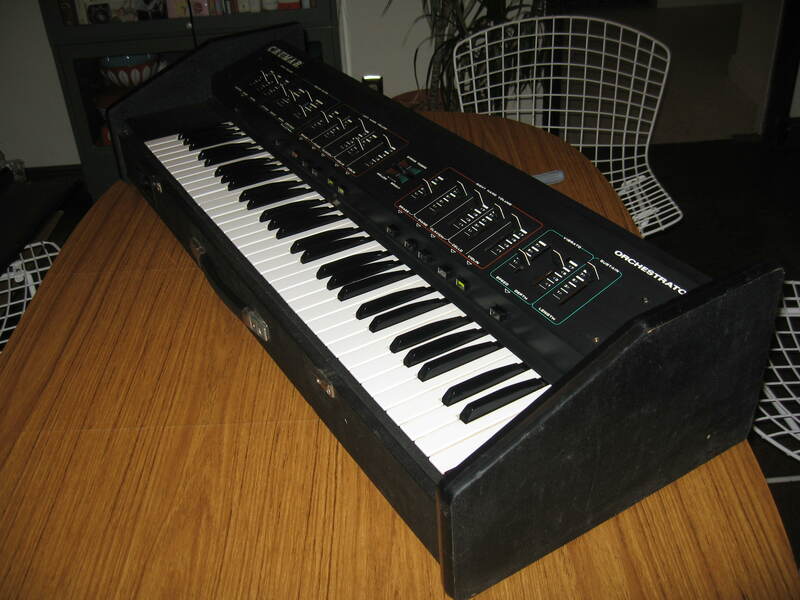 In such a way this complete, clean, low mileage, semi-functional Polymoog joined the menagerie. Recently landed Orchestrator. Looking pretty good. What could possibly be wrong? It came with the lid but no pedals. I hear the ‘Swell’ pedal is amazing -need to find or build one. Anyone have one for sale? You can only stack them so high as I like to say. Once I cleaned up the guts I refinished the wood case, detailed it and put it all back together. Despite some efforts it remained silent except for the VCF. I dropped it off to Chris and he gave it a few weeks of very part time attention -mainly due to shipping times of ordered chips. At the end. Notice it has all its slider caps here. Thanks Doug for the three I needed. So I’m weak, I admit it -really really weak. 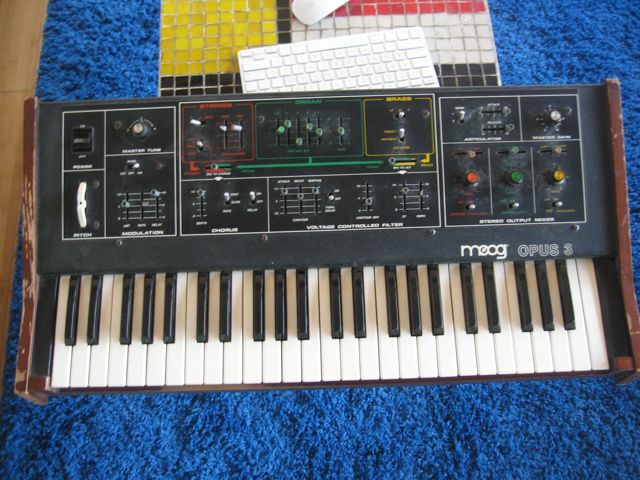 Monday evening I saw this ad for a Moog Opus 3 on Craigslist. $400 -doesn’t work. Worked when last tried. About 2 miles from my house. I resolved to call in the morning around 9, hoping it would have sold and I’d have that weird 30 seconds of self reproach for not acting sooner followed by the bliss of carrying on moments later and forgetting. I call -no answer. I start to leave a message and as I’m half way through it they call me back. 10 minutes later I’m getting in the car to go look at an Opus 3. 30 minutes later I’m driving home with it -lighter of wallet, but only 7/8th’s as light as I could have been. Alas. In all its colorful what-were-they-thinking glory. Missing a few slider caps, crappy looking wood and dirty. Nothing I can’t handle. Oh, and it powers on but doesn’t work -yeah- that too.